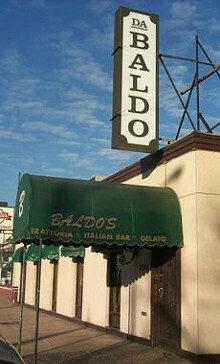 Upon entering Da Baldo's, guests are treated to the white-linen, old-school Italian dining experience with a St. Louis touch. Appetizers include prosciutto and melon, stuffed mushrooms and -- here's the St. Louis part -- toasted ravioli. The pasta menu offers fettuccine alfredo and cannelloni among other options. Da Baldo's entrées feature the mainstay Italian staples -- seafood, chicken, steaks and plenty of veal choices, including veal liver ghiotta with tomato, onions and capers. Finish off the classic Italian meal with one of Da Baldo's many options, such as tiramisu, sorbet or tartufo - chocolate and pistachio ice cream in a chocolate shell.